Well, Mother's Day has come and gone and that is fine by me because I did not care much for it this year. My gift left me wanting. I mean, my real gift was great because of course I went to the mall and picked it out myself. I kept telling the kids they bought me a wonderful Mother's Day gift and when they asked if they could see it I told them they had to wait, for it must be a surprise to SOMEONE. It was the surprise, post-dinner gift I didn't like so much but I shan't complain for the man hated it more than I did. But I declare, I believe he asked for it when he tried to garburate many and much potato and turnip peels. He made a lovely dinner of BBQ steak, roast potatoes, garlic mushrooms and turnip (which I love so don't ewwww me) and then began his Mother's Day cleanup. He's good at Mother's Day, I will give him that. But...he is insistent the garbuator work to a standard most garburators refuse to work at. I try to ease the garburator in when I'm dealing with it. I go slow, little bits here and little bits there. I talk real sweetly to it. I don't want any garburator rebellion whilst cleaning up. The man, on the other hand, thinks a certain way and it's his way or the highway. The man is passively stubborn. But don't tell him I said that or he may not so passively rebel against me. Anywho, I am positive I am not spelling garburator right. 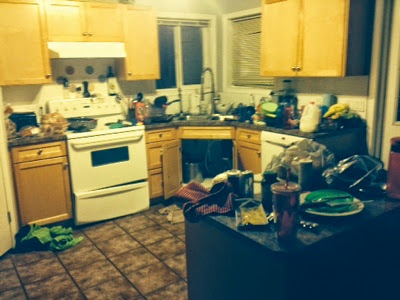 So although Mother's Day dinner was a delight, the kitchen at the end of the day was not. It was a hideous mess because as hard as he tried he could not unplug the blasted demon before we were forced to turn in. Don't even mention the oven drawer. The thing is a disaster! Did I mention we had started a load in the dishwasher and were forced to stop it because the sink guts were all taken apart? No? Well I'm telling you know. The sink guts were everywhere and dishwasher was now sitting idle, mid-load. Gross. Day 2. The man comes home from work with vats of drano and goes to work. Pouring drano in, waiting, snaking, blowing air, garburating, attaching sink guts, removing them, pouring drano, waiting and so on and so forth in that fashion until once again it was time to retire into bed for the night. Day 3. By this time I am anxious about the mess in the kitchen. I am feeling a panic attack coming on and so off I head to hot yoga because if you can't come to terms with life's tragedies while sweating your brains out then you are not qualified to have life tragedies. It came to me whilst lying in a pool of my own sweat that I was going to have to do something about the kitchen. I started contemplating various caveman techniques. I decided to go home and wash the dishes by hand. But wait. There's more. I accidentally closed the dishwasher door and it started up again unbeknownst to me. I left the kitchen and returned a few minutes later to see water pouring out from under the cupboard doors. It was pouring all over the sink guts that were lying on the kitchen floor. The same sink guts that, used correctly, keep the water contained under the sink. Now, they are nothing more than floor decor. So I cleaned up that mess. And I was still sweating from all the yoga-ing I had done earlier. And the leaning over the tub for an hour. I was a sweaty annoyed lady. Have you seen those? They aren't pretty. Then the man came home, with more drano, and a determination that spoke volumes to me in a silent way. It said something like, "I will conquer this plug and don't even mention a plumber to me because I am the victor in this story, not some stinkin' plumber." We admire the man and his ambition. I grinned, tucked my aggravation away, and watched him poor more drano down the pipe. And wait. And fiddle and fuss all about the sink. We stood staring at two sinks full of water wondering when this plague would lift. 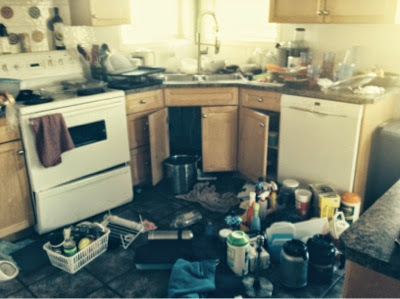 By golly, oh plague of broken sinks and stinky dishes, be gone from this home. He plugged up one side and ordered me to hit the garburator switch. Which I did because I am nothing if not a team player. The sinks drain. It is a belated Mother's Day miracle.We stood in awe and amazement. And then we high fived because again, team players. I have since cleaned up the kitchen, done multiple loads in the dishwasher and pretty much gone on my merry way. And that, my friends, is how the Dabels do Mother's Day.